Inner Listening by Ajahn Amaro. 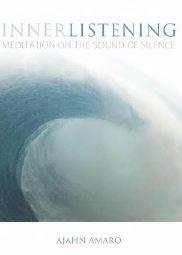 Inner listening’ or ‘meditation on the inner sound’ or, in Sanskrit, ‘nada yoga’ are terms all refering to attending to what has been called ‘the sound of silence’, or ‘the nada-sound’. ‘Nada’ is the Sanskrit word for ‘sound’ as well as being the Spanish word for ‘nothing’ – an interesting and accidentally meaningful coincidence. Nada is a basic training tool for practices like vipassana and samatha. Thank you very much for the ebook download. Thank you Sir, A wonderful enlightening book.